Join the List, Get Free Things. When you join my Insiders list you get exclusive access to my growing library of free resources. Additionally, you’ll get semi-regular emails from me containing my latest findings, insights, and strategies for getting noticed on social media and growing your brand. Occasionally, I may also let you know about new product offerings and offers. I will only share things that I believe will help you in your online growth journey. Here’s a list of all the goodies just waiting for you to download them. My popular visual content templates in both .jpg and .psd format. All the recommended sizes you need for creating perfect Instagram images (even a template for Stories). All the recommended sizes you need for creating perfect Facebook profile photos, covers, and more. Create 20+ different social media messages in less than 5 minutes and have a month’s worth of social posts. 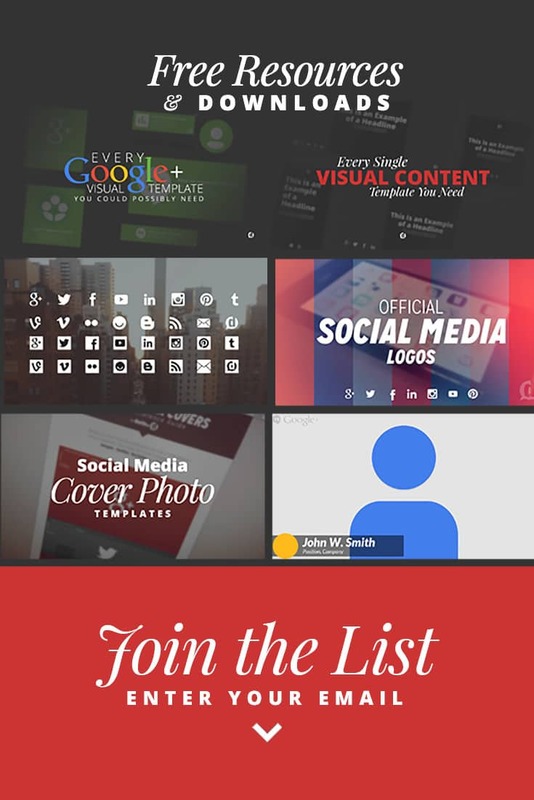 Templates to create cover photos for Google+, Facebook, Twitter, LinkedIn, and YouTube. Not only .jpeg versions but also .psd and .ai versions of all the major social network logos. My free social media icons along with the .psd and .ai files for them. Bonus: Social media-related icons from Vecteezy. What are you waiting for, get on this list!